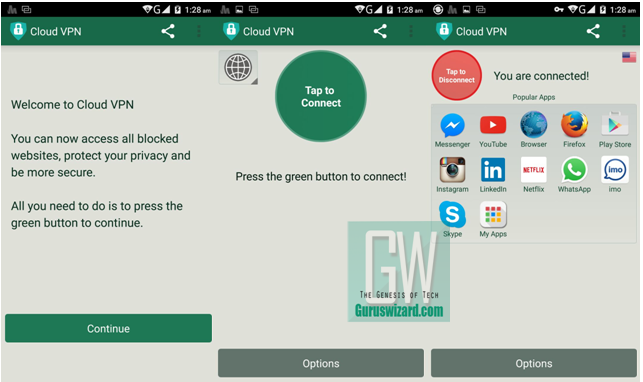 When it comes to selecting the best VPN applications for Android, I always take my time to select a very outstanding VPN app with numerous features. I don’t just select any kind of VPN app which would compromise my privacy at the end of the day. I know of many VPN access and what they’re made of. However, most of the so-called sophisticated VPN apps are paid VPN apps, that is, you pay to get some limited amount of VPN access. So don’t get me wrong when I say the CloudVPN is the best free VPN for android. Note the words, “BEST” along with its associates “FREE”. Of course there are better VPN apps, but the question is, ARE THEY FREE? ARE THEY UNLIMITED? Let me quickly make a quick overview about cloudVPN. Those of you that do make use of VPN applications already know the benefits of VPN access. this is not some kind of free browsing VPN apps like psiphon or netify because I know that’s what most of you might be thinking of now. This is a VPN app that gives you unlimited VPN access for free so that you can protect your privacy, unblock sites, bypass firewalls and internet filters while at home, work or school. Remember my previous guide on how to create your proxy server at home work or school. If you did miss that guide, do check back. 5. Connect in a single tap. Where to download CloudVPN for Android? Always check-in for the latest version of CloudVPN for android here. Please feel free to let me know if you experience any issue during the process of connecting the VPN. Less I forget, the VPN application also connect 3G, 4G and all other mobile data carrier.